Immerse yourself into the breathtaking nature around Lake Garda and enjoy pleasant moments of absolute relax in a welcoming and homely environment. The strategic position of our B&B allows you to reach turistic places like Riva del Garda or Arco to access all possible services and engage in all the various outdoor activities the Alto Garda area can offer, such as: mountain biking, climbing, sailing, windsurfing, trekking and more. 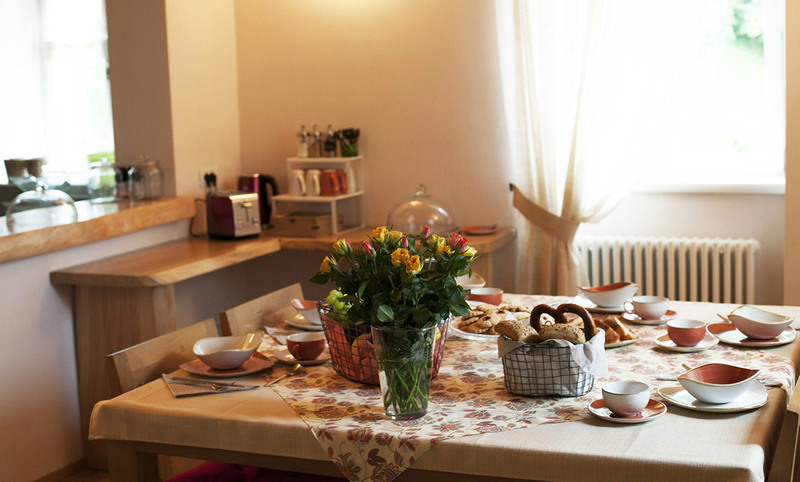 The feeling inside the B&B Vello d'Arco is intimate and homely, always cheerful and hospitable, but at the same time both confidential and descreet to guarantee and safeguard your privacy. The staff is always at our guests' disposal, to satisfy all your needs and answer any question about the sorroundings, upcoming events nearby and anything else you might need. Our B&B stands out for its dedication providing the maximum comfort and ease possible to our guests, which is reflected in the choice of natural and chemical-free materials, pure natural cotton linens and organic products in all areas, from the services to the cuisine. The building itself, dating back to the XIX century, has been recently completely restored employing innovative green building materials and techniques. Breakfast offers a wide array of choices between sweet and sour, favouring home-made and organic delicacies. The and coffee are always available, as well as juices, cakes, fruits of the season and more. The strategic position of our B&B allows you to reach turistic places like Riva del Garda or Arco to access all possible services and engage in all the various outdoor activities the Alto Garda area can offer, such as: mountain biking, climbing, sailing, windsurfing, trekking and more. The feeling inside the B&B Vello d'Arco is intimate and homely, always cheerful and hospitable, but at the same time both confidential and descreet to guarantee and safeguard your privacy. The staff is always at our guests' disposal, to satisfy all your needs and answer any question about the sorroundings, upcoming events nearby and anything else you might need. Our B&B stands out for its dedication providing the maximum comfort and ease possible to our guests, which is reflected in the choice of natural and chemical-free materials, pure natural cotton linens and organic products in all areas, from the services to the cuisine. The building itself, dating back to the XIX century, has been recently completely restored employing innovative green building materials and techniques. Elena is the perfect room for two or three people. The comfortable beds feature organic cotton pillows with wool and cirmolo chips (a special pine called "Pino Cimbro") providing scented notes to enhance your sleep with its relaxing properties. This room is located at ground floor and features two entrances: one from the beautiful garden and one from inside the building. Adele, with two single beds or a big double bed, is perfect for two guests. The beds are perfect to provide you with the most comfortable and relaxing sleep possible. Each bed features a special organic cotton pillow with wool and cirmolo chips (a special pine called "Pino Cimbro") providing scented notes to enhance your sleep with its relaxing properties. This room is located at ground floor and faces our beautiful garden. Micol is the biggest room of the house and can easily welcome 4 guests. It features 4 single beds or 1 cozy double bed with 2 single ones. It also includes a private bathroom with shower and all possible comforts. The pillows are made of organic cotton with wool and cirmolo chips (a special pine called "Pino Cimbro") providing scented notes to enhance your sleep with its relaxing properties. The room faces the garden outside and features a double entrance. Lake Garda and Riva del Garda, an unmissable spot to have a swim, a nice walk or engange in one of the many outdoor activities by the lake. The town offers museums and churches of high historical and cultural interest, apart from many different shops and restaurants to enjoy typical products and dishes of the area. Arco and its castle, the perfect spot for a relaxing walk in the town center between monuments, climbing shops and typical products from the area. Climbing up the town, going uphill, you'll pass through silvery olive trees and reach the castle, a massive structure which dominates the whole valley from atop extremely overhanging stone walls which survived Napoleonic wars. Lake Ledro and the stilt huts museum, situated at about 650m above sea level, the lake impresses with its beautiful color and crystal waters, sorrounded by woods. Its ideal for a nice walk, a swim or engage in water sports. By the oriental shore you can find the stilt huts museum, UNESCO heritage, where you will witness impressive and remarkable historical evidences from the bronze era. Lake Tenno and its magical and breathtaking turquoise color is one of the jewels of the area: immersed in the woods, in silence and peace of nature. Its perfect for long walks or a refreshing swim. Around the area you'll find many beautiful small medieval towns which will take your breath away. Scenic walk of the Ponale, a walkable and cyclable path dug into the rock around the year 1800. Its one of the main attraction of Riva del Garda for its unique historical and environmental properties. 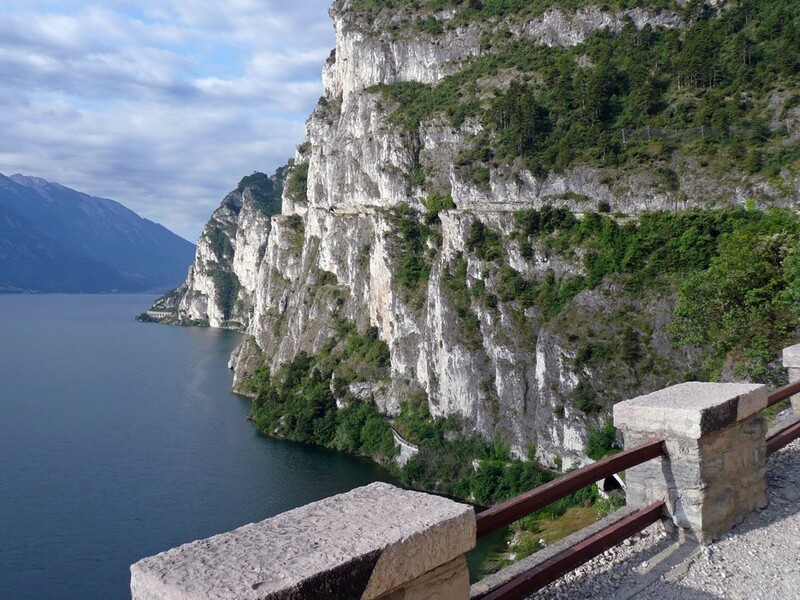 The path begins by the historical hydroelectric power plant then starts climbing up above Lake Garda, making everybody who walks it fall in love with its spectacular view. Mount velo and its climb celebrated among the "Great climbs in cycling" in Trentino, its a wonderful panoramic path you can tread by mountain bike or electric bike which begins in Bolognano and end at the Saint Barbara pass, at 1.170 m of altitude. Many amazing views of Alto garda are scattered along this amazing route.